Welcome–we’re pleased you’re interested in building a brighter future for the Mill River and the communities it travels through. How long is the Mill River? How many people does Lake Whitney provide drinking water for? Find out in our Mill River by the Numbers factsheet! Due to large file size, PDF optimized for Adobe 7.0 and later. If you are unable to view the document or would like access to the appendices, please email us at reducerunoff@savethesound.org. 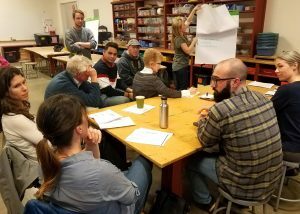 From March to September 2018, Save the Sound worked with citizens, the state of Connecticut, municipalities, and other watershed stakeholders to gather information, identify concerns and establish priorities for the Mill River Watershed. 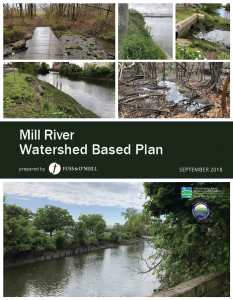 Following months of work from a volunteer steering committee and the public, the Mill River Watershed Plan has been completed with the overarching goal of improving water quality throughout the Mill River watershed. Projects identified in the plan will be eligible for federal funding through a partnership between the EPA and Department of Energy and Environmental Protection (CT DEEP). 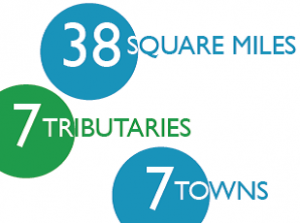 Projects have been identified in towns and cities throughout the watershed and include solutions such as rain gardens, bioswales, and other green infrastructure practices to capture and reduce stormwater runoff to the Mill River. Other goals outlined in the plan include: restoring safe access between residents and the river, educating residents on the connection between land use and a healthy river, and promoting sustainable land management practices throughout the watershed. 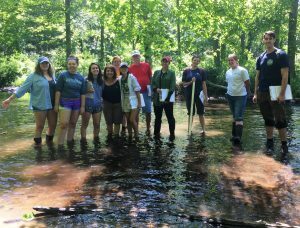 Funding for this plan was provided by the Connecticut Department of Energy and Environmental Protection through a U.S. EPA Clean Water Act Section 319 grant, a grant from Connecticut Community Foundation, and The Watershed Fund of the Regional Water Authority.